Which GoM ship do wewe prefer? what are the vitabu kuroko read about misdirection ? who are wewe close to in heights ? wewe remember what happened in the cafeteria as wewe wait for Aomine at the mpira wa kikapu court. wewe were a highschool student at Touou high, and wewe were on the girl's mpira wa kikapu team. wewe were the best one on your team. And wewe were also famous for your dunks despite your small posture, so wewe were the ace. 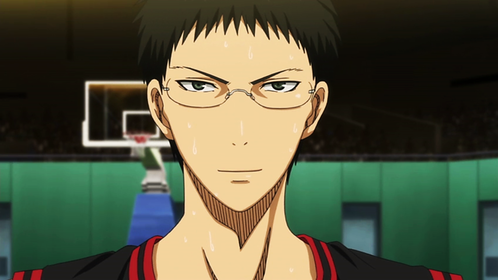 *On the first character poll, Aomine ranked 6th, with 710 votes. He went up one place on the sekunde poll, this time with 1021 votes. *On the first character poll, Kise ranked 4th, with 1065 votes. He ranked 2nd in the sekunde character poll, with 1309 votes. -Kise's inayopendelewa pastime is to go sing karaoke. -His inayopendelewa chakula is kitunguu gratin soup. *On the first character poll, Kuroko ranked first, with 2625 votes. He won again on the sekunde poll, this time with 2242 votes. Let me tell wewe about Hanamiya Makoto. He’s 17, a sekunde mwaka in Kirisaki Daiichi high school, which is a rich private school known for some of the highest promotion rates in Tokyo, which already means that either he’s smart, dirty rich au both. He also pretty much took over the whole damn club after his first mwaka and got the coach to quit, then became the captain and student coach for his mpira wa kikapu team in his sekunde year. Not just captain. Not just coach.BOTH. a comment was made to the poll: Momoi au Riko? a comment was made to the poll: Who is your LEAST inayopendelewa player from the Generation of miracles? Junpei Hyūga is Voiced by:____________. Who's your juu 10 favourite character in KNB?